So basically you just need hot dogs, cheese slices, bread, egg, and oil (to fry). Just like making roti gulung sardin, penyekkan the bread with a rolling pin, or I've read up somewhere that you can use a glass. Anything, asalkan boleh penyekkan roti tu. And then layer the cheese slice on top of the bread. 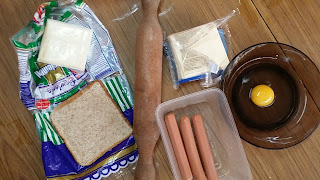 Bread, cheese slice, and hot dog. 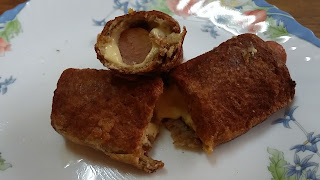 Kalau nak berjual, hot dog tu belah dua, untung lebih sikit kan (sarcasm disitu).... Roll them all up, dip it into the egg, and fry it. I use a flat frying pan, kuali leper, bukan kuali melengkung tu. Fry it with the end down first so that the roll tak terburai. Oh because I fry it in a flat pan, the roll tak tenggelam habis so turn it over now and then to make sure the whole roll is fried evenly. Api not so high to avoid from hanguih ada masak idok. Alhamdulillah... Though I only managed to make two because I only had two pieces of bread left, tapi jadilah. bash, colour dia.. hehehehehe. ni febret time study dulu. back in uni, kawan sya asal weekend je buat. simple tp sedap kan.
Hahahah! Ada juga yang menegur pasal colour. Dah adjust habis dah tu... Hahahah! Maybe sebab guna roti whole wheat, tu yang colour macam hanguih je tu. Haah simple betul benda ni. Pergh... Letak blackpepper sauce memang mengancam lagi la rasa dia!